We’ve been visiting family in the SF bay area and I just had to jump in and get something done. The is the 61st painting in the challenge. I was going to just post groups of 4 in the future, but couldn’t resist posting this. We had a great time in Marin (I didn’t tell everyone that we brought the sunny days up there with us!) Actually, we had a little rain on Saturday, but the barbecue on Sunday was in a wonderful sunny day and the three birthday cakes (this was a family celebration), were perfect. 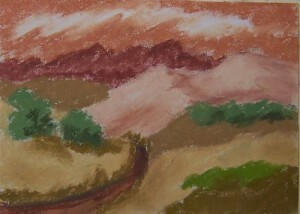 This entry was posted on Tuesday, May 31st, 2011 at 2:30 pm	and is filed under 100 Pastel Challenge, Color, Landscapes, Paintings, Pastels. You can follow any responses to this entry through the RSS 2.0 feed. You can leave a response, or trackback from your own site. A lovely bouquet of color. So different but still perfect. Ooh what a great combination of colors! Thanks, Leila. This time I took a chance and didn’t prop up the first 60 so I wouldn’t mistakenly use the same colors, but I think I got away with it. Thanks, Thom. I starting to play more with the mountain shapes as well. The next 39 are really going to be difficult to do without duplicating. I like the fact that I can pre-cut the 5 X 7 sheets and then sit down and knock something out when I’m feeling like doing a little bit. My daily dose of art….yes, I definitely think it’s an addiction!